But here's stacks of all the stuff you can get your grubby little landlubber hands on! Geeyarg! I be a pirate! Geeyarg! Everyone loves pirates! I mean ya get yer own ship to sail the seven seas, do what you please, and also steal, kill, destroy, and steal some more. 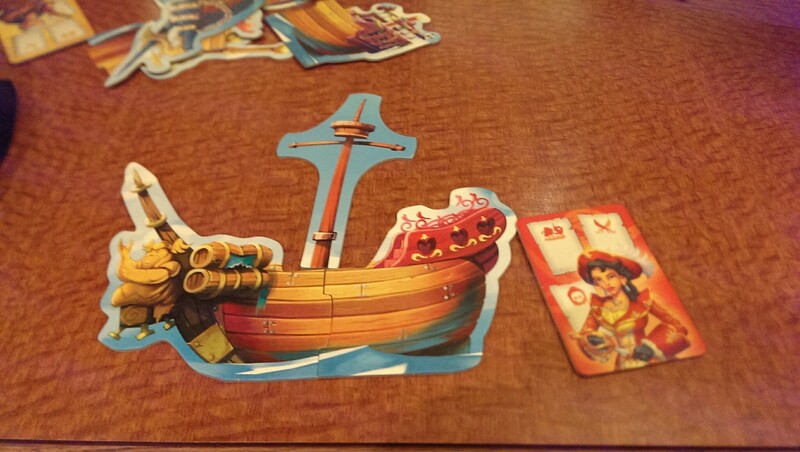 In Rattle Battle, you get to build your own ship, then head out to sea to hunt down merchant ships to earn cash and to loot for goods. There are a great number of phases each round, so I’m just going to glaze over them a bit. Basically, you head out to sea. Each player has a few dice representing their ships, and the current mission quest thing adds a number of merchant ships of varying strength. One player takes ALL the dice into their hands and drops them into the box top, which represents the sea. Then players take turns using their ship upgrades and crew to jockey for a better position. Sails allow movement, cannons let you sink ships from a distance, and other upgrades can add extra movement or cut merchant ships to pieces. After everyone uses up their actions or passes, combat between any remaining merchant ships is resolved. 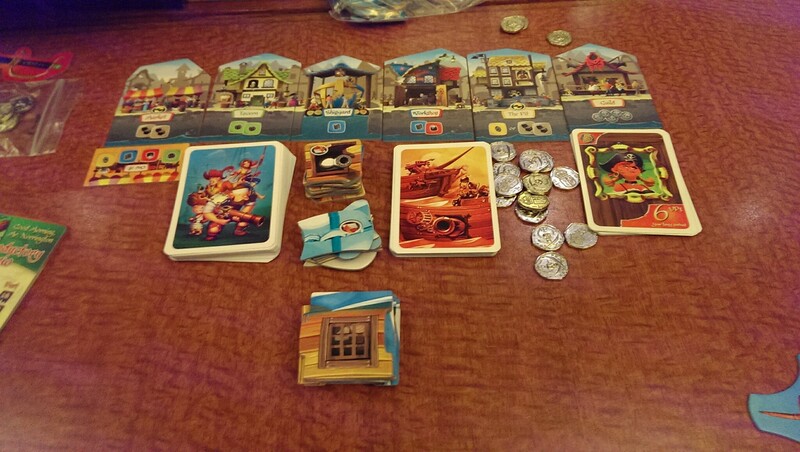 If one of your dice is touching a merchant, you get to board them which gives extra loot. Otherwise, the closest ship fights first, and the bigger number on the die wins the battle. If you sink a ship, you get dubloons. If you have ships in the battle at all, you get loot. Then everyone goes to port and you can spend your loot on ship upgrades, crew, parts, more dubloons, and finally… Victory points! Ship parts include sails, cannons, and cargo holds. Sails give you more movement points, cargo lets you store more loot, and cannons increase the power of your dice and allow you to destroy merchants from afar rather than let someone else get all the loot. Upgrades give you advanced abilities like extra defenses or more attacks, and Crew add even more abilities that allow you to get extra cash or loot under certain situations. But it’s dubloons that matter; dubloons get you points, and buying victory cards with dubloons gets you even more points, so it’s off to the seas again, if you can survive! There are a lot of moving parts to Rattle Battle, but they’re a lot of neat moving parts. It was a lot of fun to chuck a fistful of dice into the sea, and then sail around scooping merchant ships out from under other player’s noses with your cannons. The ship components are great, as you get to see your ship expand with new parts as you physically at them to your player board. I can’t believe I forgot to take a photo of my ship at the end of the game to compare it to the starting place! Gah! But here’s stacks of all the stuff you can get your grubby little landlubber hands on! Since there are so many moving parts, the game can probably get a bit long with more players. But everyone is involved and doing stuff the whole time, so if you’re not in a huge rush, you can sit back and enjoy the experience. You’ve got a lot of options including what you add to your ship, and the dice-rolling system is clever and unique. It’s not just WHAT you roll, it’s where your dice land, but even then, as you get more ship upgrades you still have options you can take and actions to use. And you always get at least some loot to buy more upgrades for the next round. It’s color and fun, with a lot of great art. Oh, and every captain comes in both male and female, so three cheers for representation, right? Anyhow, avast, heave to quarters, or whatever. Pirate away!